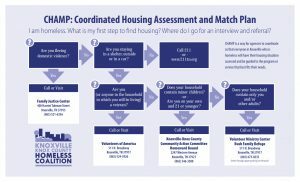 The Coordinated Housing Assessment and Match Plan, or CHAMP, is the coordinated entry system for Knoxville/Knox County. The Purpose: Our goal is to make homelessness rare and brief by assessing the unique needs, barriers, and strengths of those experiencing a housing crisis and then to match that person or family to the resources, services, and housing available in Knoxville/Knox County. While participating in CHAMP does not guarantee housing for all experiencing homelessness, it is the best way for our community and service providers to respond to those needing stable housing. CHAMP is intended for all people experiencing *homelessness, regardless of household composition, age, or situation in housing. Single adults, young adults, youth, families and veterans are all eligible. *To be eligible, a homeless individual or family must be living and sleeping outdoors, a place not meant for human habitation (an abandoned building, car, etc. ), in an emergency shelter, fleeing/attempting to flee domestic violence, or exiting an institution where that individual resided for up to 90 days and were homeless before entering that institution. There are three Designated Access Points in Knoxville. You can go to any one of these places for help in making a plan for housing. Hours are Monday through Friday from 8 a.m. to 4:45 p.m. Hours are Tuesday and Thursday from 9 a.m. to 3 p.m. Please call in advance: 523-3926 ext. 261 (Catherine) or ext. 260 (Tommy). Hours are Monday through Friday 9:30am – 12pm and 12:30pm – 2:30pm. CHAMP intakes are based on assignment on a walk in basis, starting at 9:30am. You may have to wait for your appointment. While these Designated Access Points are the suggested starting points for CHAMP, many agencies have staff members knowledgeable about CHAMP and are prepared to help a person experiencing a housing crisis. What happens after I take the intake assessment? If you are eligible for a program, you will receive a referral. The program might be at the same agency where you completed your CHAMP intake, but it might be somewhere else. Once the program you are referred to has an opening, someone from the agency will contact you directly to schedule an intake. 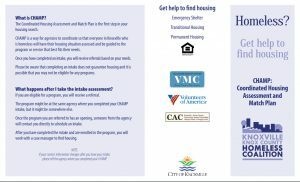 After you have completed the intake and are enrolled in the program, you will work with a case manager to find housing.